For companies and operations that handle their products with drums (stainless steel drums, steel drums, plastic drums, fiber drums etc. ), drum handling equipment is vital to the moving and storage of these drums. The S. W. Betz Company has had significant experience with a number of different pieces of drum handling equipment. It is important to purchase the correct piece of drum handling equipment for your needs, and the S. W. Betz Company can help you do that. Some of the drum handling equipment that we assist customers with is listed below. Drum Rollers – Drum rollers/drum rotators/drum turners lift drums from floor level so that it is horizontal to the floor. Then, the closed drum is rolled to mix and blend the contents. Drum rollers can help save time, labor and money by minimizing the time needed to mix contents in your drums. This method is also helpful because you do not have to open the drum to mix the contents. Drum Tumblers – Another piece of equipment that helps in the mixing of ingredients inside your drum. 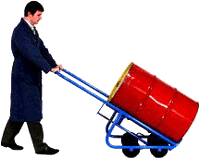 Mobile Drum Handlers – Mobile drum handlers allow an employee to pick up a drum, raise and lower it, move it from one area to another and even dispense its contents. Forklift Drum Attachments – With a forklift drum attachment, any forklift has the ability to safely and easily transport your drums. Below-Hook Drum Carriers – Lift, move and/or pour a drum below-hook with your hoist or crane. Drum Rackers – Stacker that enables the lifting, transportation and racking of your drums. Drum Trucks (2, 3 & 4-wheel drum trucks) – Drum trucks provide an ergonomic, manual solution to transporting your drums from one place to another. Drum trucks are one of the most common pieces of drum handling equipment. Drum Palletizers – Move drums to and from pallets. Drum Dollies – Move and position your drums with round drum dollies. Drum Cradles – Lift and transport 55-gallon drums. Stainless Steel Drum Handling Equipment – Particularly for use in pharmaceutical, medical and food operations. A complete line of stainless steel drum handling equipment is available. Accessories & Options – A number of different drum accessories are available including drum faucets, drum wrenches, drum pumps, drum heaters, drum cones, diameter adaptors, dolly handles, and more. Custom Drum Handlers – When a stock option will not meet your needs, the S. W. Betz Company can work with you on a custom design to fit any and all drum specifications. The S. W. Betz Company is a preferred distributor in Maryland and the Mid-Atlantic region for Morse Manufacturing Company. Morse Manufacturing Company is located in East Syracuse, New York and has been manufacturing and providing drum handling solutions since 1923. If you are in need of or would like more information on any of our drum handling equipment, please contact us and one of our team members will be happy to assist you. For more information about Drum Handling Equipment or any other product or service from S.W. Betz, fill out and submit the form to the right.